Did you know that Strawberries are the only fruits that wear their seeds on the outside? The average berry is adorned with some 200 of them. No wonder it only takes one bite to get seeds stuck in your teeth. Strawberries have grown wild for millennia throughout the world. Today, there are over 600 varieties of strawberries that differ in flavour, size and texture. Perhaps it is a good thing that this berry is available throughout the year as it is celebrated by nutritionists for its numerous health and beauty benefits. 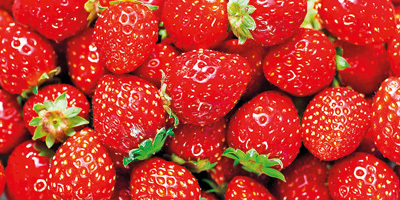 Commercial cultivation of strawberries in Sri Lanka commenced in early 2000. The fruit is now cultivated year round and there are several strawberry farms in the up-country region. Some of us will be familiar with the neatly arranged packs of strawberries in supermarkets, while in Nuwara Eliya nearly every vendor in town has stacks of strawberries for sale. Strawberries are a member of the rose family, which is characterised by showy flowers with five separate petals. Fragaria Xananassa as it is botanically identified is a low-growing creeper belonging to the family Rosaceae, in the genus Fragaria. Strawberries do not ripen after they are picked, so when buying this succulent delicacy look for ones that are shiny with a deep, red colour and are firm, plump, and free of mould. Avoid ones that are dull in colour or that have green or yellow patches. The fruits are extremely perishable, so should be stored loosely covered in the refrigerator. Strawberries have always been a favourite ingredient of chefs around the globe especially when it comes to colourful eye-catching desserts. But in recent years culinary professionals are using strawberries across the menu all day and throughout the year. Strawberries are great in jams, pies, salads, toppings, cakes, preserves smoothies, ice creams and juices. If you are watching your waistline, why not sprinkle a little black pepper over your strawberries instead of the usual calorific cream? It doesn’t sound that appetizing, but you’ll be pleasantly surprised. You can add sliced strawberries to a mixed green salad, or layer sliced strawberries and other fruits with plain yoghurt to make a parfait dessert or place sliced strawberries on toast instead of jam. Strawberries also pair perfectly with proteins and adding frozen strawberries instead of ice into drinks will add flavour, nutrition, colour and frosty appeal. The heart-shaped outline of the strawberry is the first clue that this fruit is good for you. Strawberries are an excellent source of antioxidant-promoting vitamin C and manganese. Just one serving, about eight strawberries provides more vitamin C than an orange and just one cup of strawberries that contains only about 50 calories will provide more than 100% of the recommended daily allowance of vitamin C for adults. They are a very good source of dietary fibre, iodine, copper, potassium, biotin, phosphorus, magnesium, omega-3 fatty acids and also fluoride that is a component of bones and teeth and is important for prevention of dental caries. Strawberries are a sodium-free, fat-free, cholesterol free, low-calorie food. The fruit is rich in the B-complex group of vitamins containing good amounts of vitamin B-6, niacin, riboflavin, pantothenic acid and folic acid. These vitamins act as co-factors and help the body metabolize carbohydrates, proteins and fats. The flavonoid quercetin, contained in strawberries, is a natural anti-inflammatory that appears to reduce the risk of atherosclerosis and protect against the damage caused by low-density lipoprotein (LDL) cholesterol. The high polyphenol content in strawberries may also reduce the risk of cardiovascular disease (CVD) by preventing platelet build-up and reducing blood pressure via anti-inflammatory mechanisms. The fibre and potassium in strawberries supports heart health. Quercetin, kaempferol, and anthocyanins in strawberries reduce the formation of harmful blood clots associated with strokes. The high potassium content has also been linked with a reduced risk of stroke and so strawberries are recommended to those with high blood pressure to help negate the effects of sodium in the body. Strawberries are a low glycemic index food and high in fibre, which helps to regulate blood sugar and keep it stable by avoiding extreme highs and lows. So strawberries are a smart fruit choice for diabetics. Due to the anti-inflammatory effects of quercetin, consuming strawberries may help to alleviate symptoms of allergies including runny nose, watery eyes and hives as well as eczema, asthma and hay fever. Strawberries contain potassium, vitamin K and magnesium which are important for bone health. Eating three or more servings of the fruit may lower the risk of macular degeneration, a condition resulting in vision loss. Strawberries are great for the skin because of their anti-ageing antioxidants, which improve circulation and help to protect against sun damage. The fruit is filled with biotin, which helps build strong hair and nails. They also contain the antioxidant ellagic acid, which protects the elastic fibres in our skin to prevent sagging. Strawberries contain vitamin-A, vitamin-E and health promoting flavonoid poly phenolic antioxidants such as lutein, zea-xanthin, and beta-carotene in small amounts that help act as protective scavengers against oxygen-derived free radicals and reactive oxygen species that play a role in ageing and various disease processes. Strawberries also contain citric acid and malic acid. Even though citric acid can weaken the surface hardness of the teeth, the gentler malic acid which is found in higher concentrations in ripe strawberries is an effective natural whitener and therefore can be the secret to your dazzling smile. So, if you’re not already a fan of strawberries, you should be. Not only are they juicy, lustrous and a great addition to a healthy diet, they are also a genuine power food that will not only keep your heart healthy but will work wonders for your skin by brightening up those dark spots and giving your face a glow.